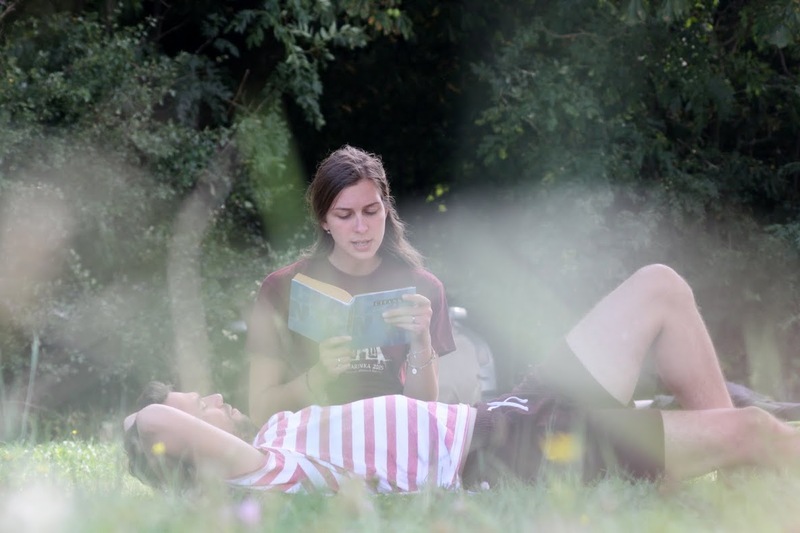 We are glad to announce that our project was awarded two prizes. 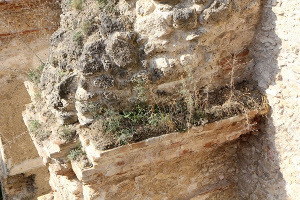 One of them, Fenix – Cultural landmark of the year 2017 , for our work on restoration and conservation of the tower of the ruin of St. Catherine’s Church that was once part of St. Catherine’s Monastery dedicated to St. Catherine of Alexandria, near Dechtice village. 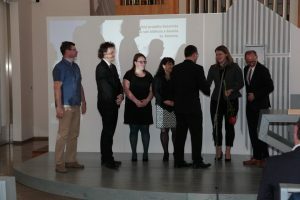 Our project representatives were awarded by this prize on November 29th, 2018, by the Minister of Culture of the Slovak Republic. The second prize that we were awarded, is the Most picturesque restored cultural landmark of the year, a public voting contest organized by SPP and SPP foundation. The appraised tower restoration, which we realized between 2010 – 2017, is a truly unique accomplishment. 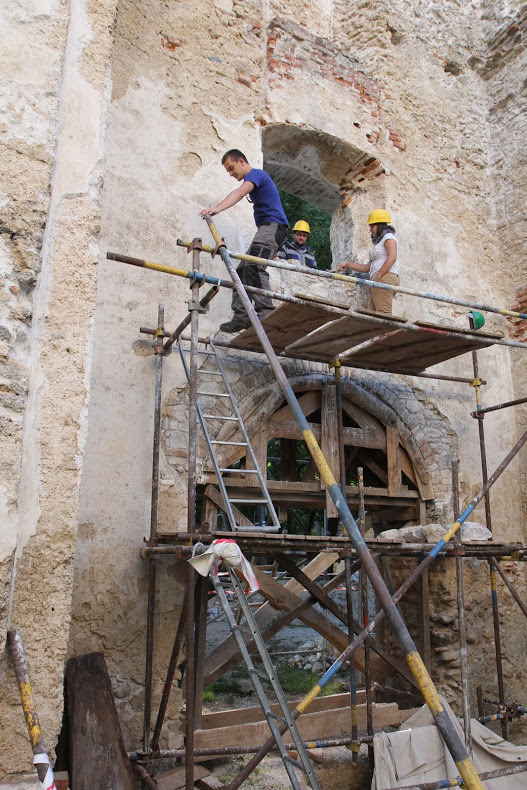 Hundreds of our volunteers from all parts of Slovakia and even from abroad participated in this restoration without any expectation of financial compensation, using traditional methods, which were used back in the days when the tower was originally built between 1700 – 1714. 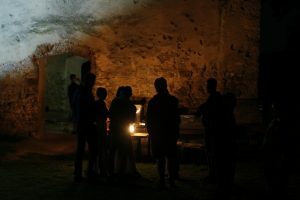 The tower was opened to public in the summer of 2017 and can be visited during the summer season with our tourist guides. 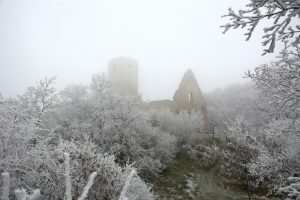 The lookout at the top of the tower (30 meters high) provides some very spectacular views. 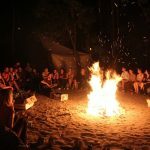 These awards further prove that our project is an example of partnership between volunteers and professionals. 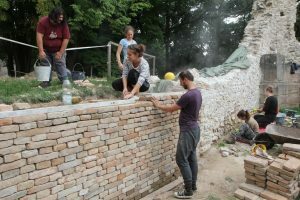 The restoration was realized in partnership with researcher and preservationist Jaroslava Žuffová, structural designer Vladimír Kohút, archaeologists Ivana Kvetánová and Michal Slivka, carpenters Miroslav Čársky and Michal Hrčka and many others. For the village Dechtice, this is the second Fenix award awarded for a monument located within their municipality. In 2015, the rotunda of the Church of All Saints in Dechtice was awarded, dating back to the 12th century. The year 2018 is marked by the celebrations of the 400th anniversary of establishment of St. Catherine’s Monastery in 1618 by the count Krištof Erdödy and his wife Barbora Thurzova. Public celebrations were held during the summer on 5th of July during the Katarínka Open Door Day. 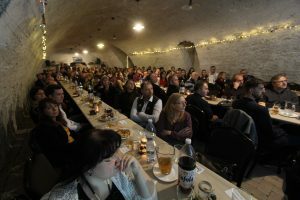 Further celebrations were held just a couple of days ago, on November 17th, in the historic manor house in Chtelnica, where the house of Erdödy lived and where they signed the establishing documents. Besides 40 professionals and invited public figures, more than 120 of our volunteers participated. As a part of the celebrations a professional convention was held, summarizing 24 years of work, which included very interesting results from archaeology, history, art, geophysics, anthropology and other fields. 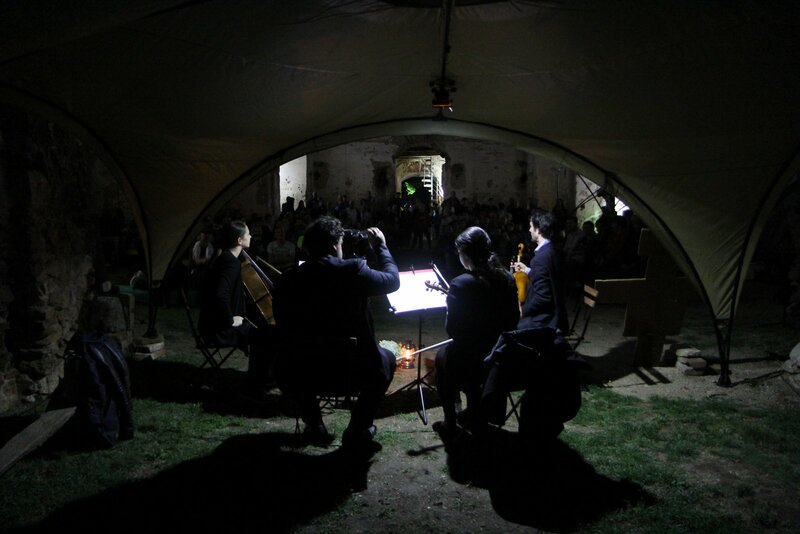 We joined the project The night of churches on the 25th of May. 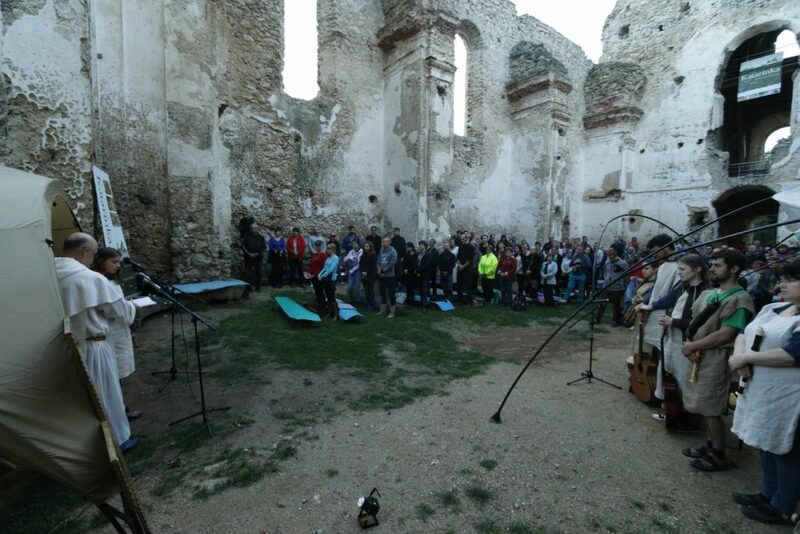 About 300 visitors and supporters took part in this event. The evening program started with the holy mass. 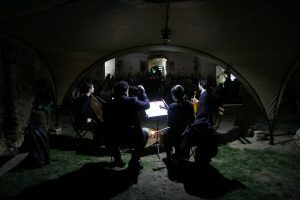 As the time advanced, the dark and silence settled, what was perfect for The String Quartet ZOE and their chamber concert. Between the walls of the church, we could hear the well-known pieces, as f. e. Four Seasons from Antonio Vivaldi and other pieces from J. S. Bach. 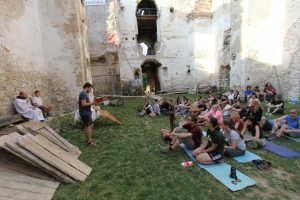 The program was concluded with a night tourist visit through the Saint Catherine´s church, monastery and its surroundings. Before the program started, there was an opportunity for tourists to enter the church tower and go on the top. 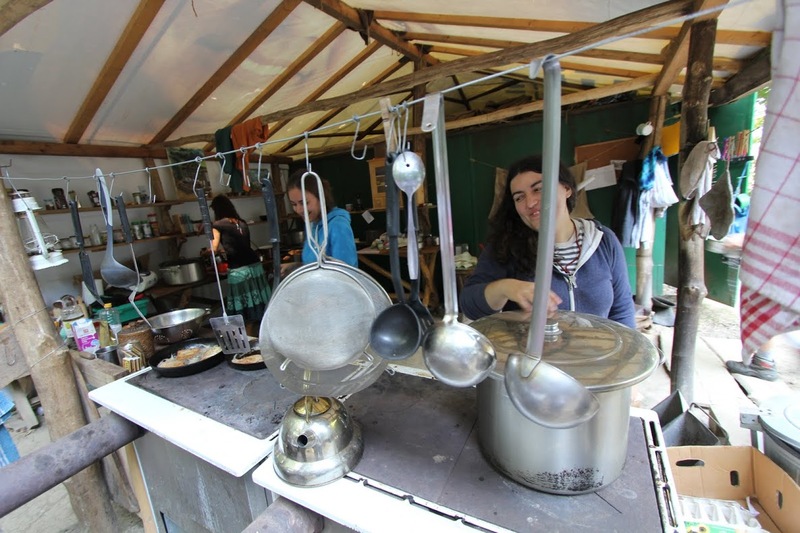 Throughout the program, the visitors could help themselves with tea and snack. 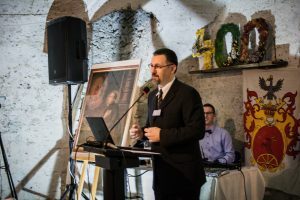 On Friday April 20, we, the volunteers from the civic association Katarínka, received at the Bratislava Castle two nominations and one of the two main ICOMOS Slovakia awards – Heritage for the Future 2017. 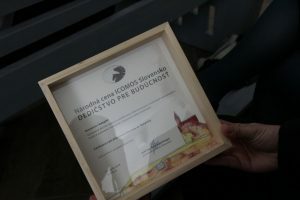 The national committee ICOMOS Slovakia awarded the main prize in the category Extraordinary Activity Leading to Increasing Awareness of the Monuments Fund Values and Strengthening the Public Awareness of These Values to the hundreds of volunteers from the Katarínka project – for saving the ruins of the Monastery and Church of St. Catherine. 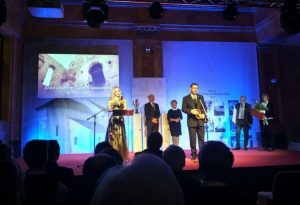 At the ICOMOS award ceremony at the Bratislava Castle, five volunteers from Katarínka, representing various generations – from the founders of the activities from 1994 up to the current hard workers and leaders of the project – received not only the main prize, but also a nomination in the category Renewal of a Monument by Using the Traditional Construction Technologies for their project Reconstruction of the Church Tower of the Franciscan Monastery Katarínka. 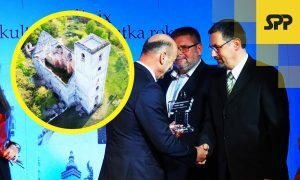 We see the award and the nomination as evaluation of our long-term selfless work to save the precious and large monument – Monastery of St. Catherine of Alexandria located near Dechtice and Naháč, where hundreds of volunteers every year move to the history without mobile phones, internet, or electricity and this year for the 24th time they will work on conservation and saving of Katarínka. 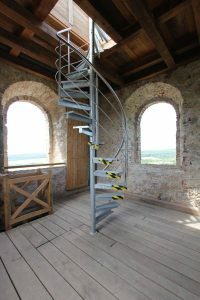 Tower reconstruction, which was also nominated for an award, allowed in 2017 to make the tower accessible to visitors as a sightseeing tower. 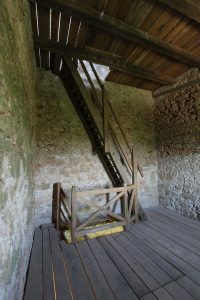 The floors and stairs in the tower were faithfully reconstructed from the hand-sculpted beams using the traditional techniques. 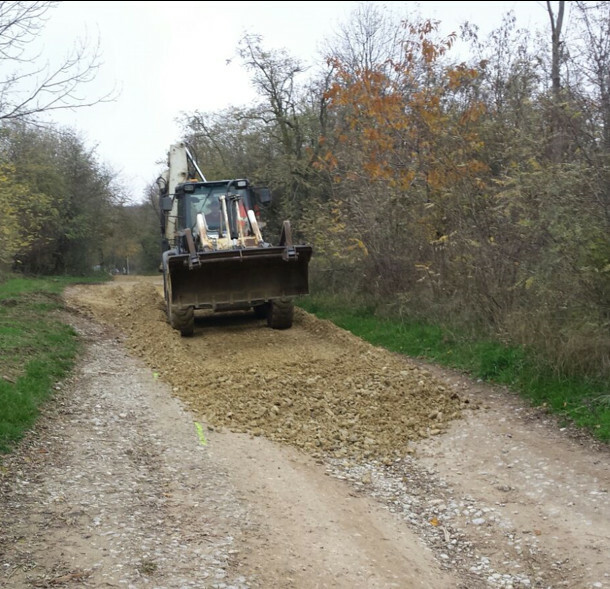 We are fixing the access road! 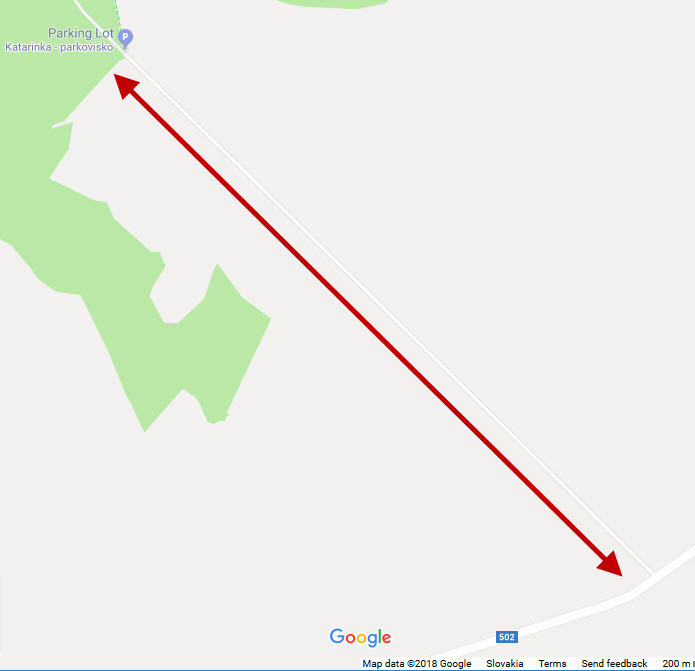 After years of using the access road, rains in the past, and increasing traffic to the parking lot, its condition has deteriorated rapidly. 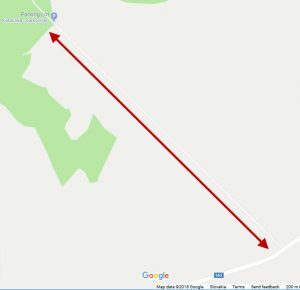 That’s why we decided in the autumn that despite the fact that the owner (Slovak Republic or Slovak Land Fund) does not have the resources to fix it (and it was impossible to do anything with it), we let someone to fix it. 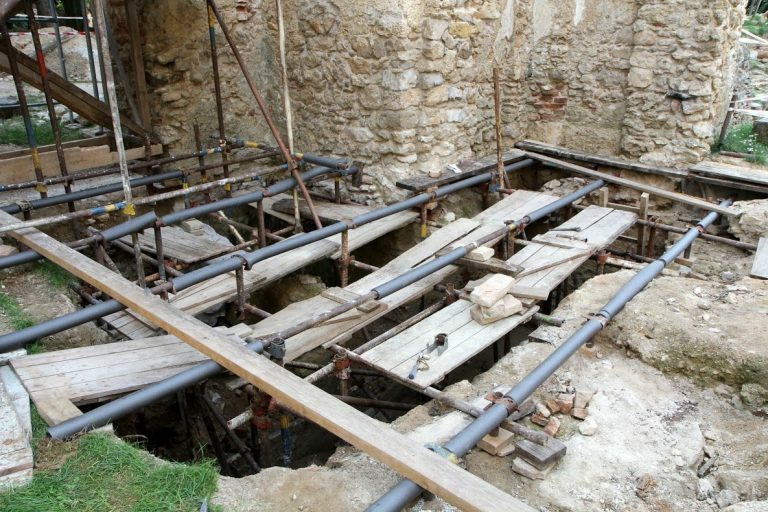 We decided to repair it “from our own” – from the grants and donations of the sponsors that we managed to gain this year. In 2017 the grants were successful so you can now enjoy considerably better access to the parking lot near the woods. 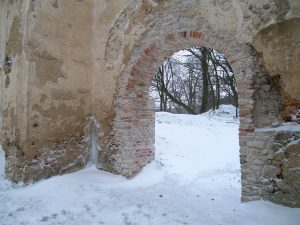 What does winter at Katarínka look like? These special views capture the atmosphere of our trips to Katarínka in winter. 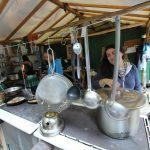 Last year there was the coldest and whitest “Bielonedeľná púť” (one-day pilgramage to Katarínka on the first Saturday after Easter) in history of Katarínka. 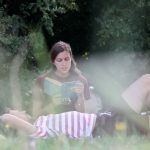 Considering work, it is mainly about realising tasks that were mentioned in advance in the previous news that covered the work plan for year 2016. It was necessary to restore the capitals of the pillars (picture on the left) while moving the scaffolding multiple times in the nave of the church, as there are 8 pillars in it. 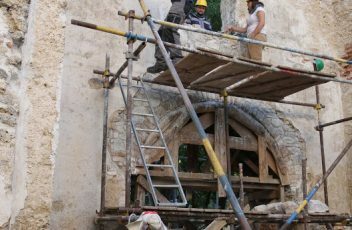 The work on the reconstruction of the segmental arch, which was mainly done in the middle of August this year, is being finished (picture on the left). 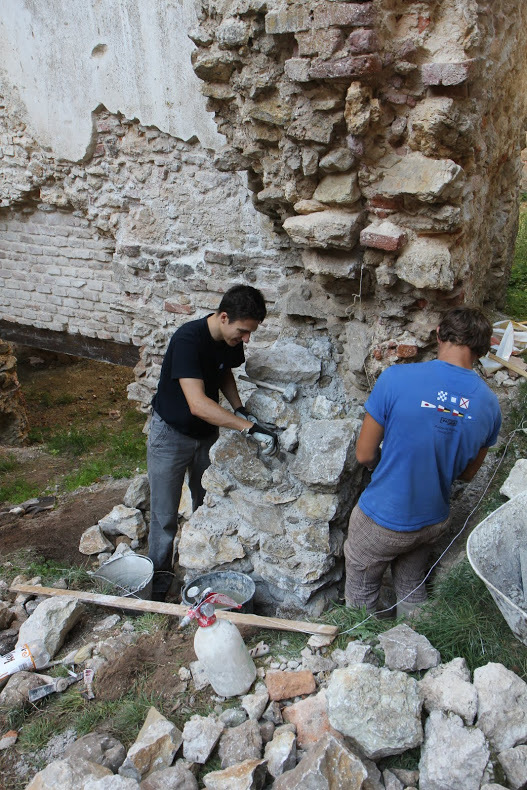 In the picture on the right, there are two young masons, who underpin one of the walls of the monastery to avoid a possible fall of the wall that could happen otherwise. In the chancel (picture on the left), south-eastern wall was renewed by filling in missing stones and conserving its stable parts. 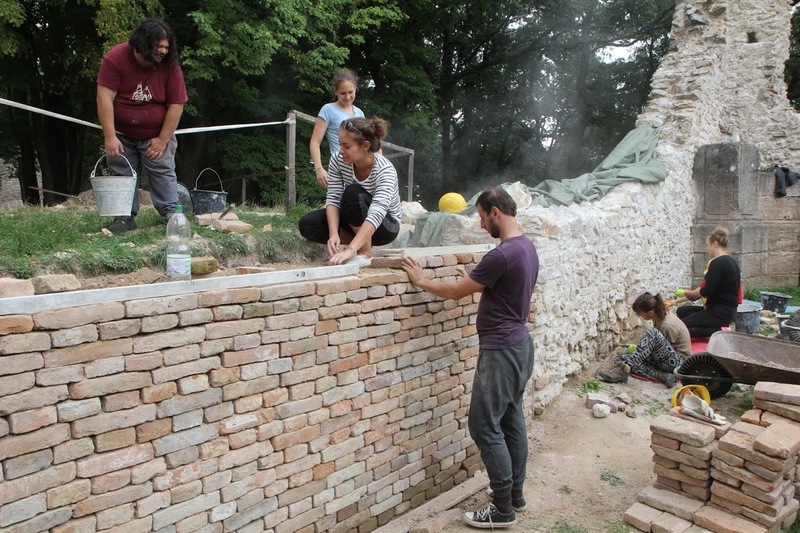 In the south-western part, the wall was recreated only from bricks, without any wet binder (picture on the right). The reason for not using groat on this wall is that we can not precisely estimate in which way the wall from the chancel continued. This will have to be discovered by the historical and archeological exploration in the future. The last carpenter and conservation works in the tower are being finished. 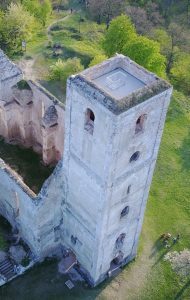 More detailed information concerning the opening of the view tower of the church will be published in September or October. Regular virgilous masses are served throughout the summer at Katarínka, as well as voluntary morning and evening prayers of volunteers, as it was customary for the monks, who lived in this monastery in 17th and 18th century. 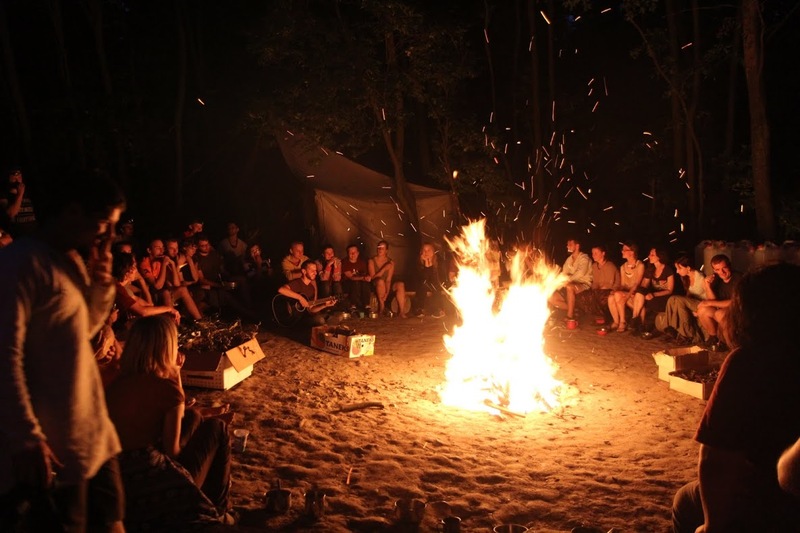 Katarínka would not be itself if there were not the people of the “same blood group”, space for acceptance, understanding, self-knowing, getting to know others, adventures, delicious food, relaxation in the nature etc.